>> During the month of March, Women AdvaNCe is exploring the minimum wage and its effect on North Carolina women and families. We delve into a different aspect of the minimum wage each Wednesday. Today we review research from the recently published Shriver Report. Last year in North Carolina, more than>> 90,000 working women earned $7.25 or less an hour. Add that to the number of men earning minimum wage, and nearly 140,000 North Carolinians showed up for work and earned a paycheck, but didn’t earn enough to keep themselves or their families out of poverty. According to >>The Shriver Report, women earning minimum wage are unhealthy, unhappy, and rapidly losing the resources they need to care for their loved ones. Even as they earn low wages in the workplace,>> these women’s share of unpaid work—caring for young or old family members—continues to increase, overtaxing them to a point of desperation. 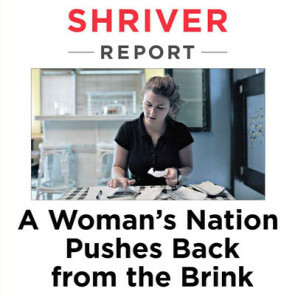 The Shriver Report, a national project spearheaded by the Center for American Progress in conjunction with media leader Maria Shriver, studies societal change with a focus on forward progress. The most recent report, released in early 2014, is titled>> A Woman’s Nation Pushes Back from the Brink, and builds on previous research regarding women’s happiness, healthiness, and their roles in today’s society. After polling more than 3,000 people, researchers at gathered statistics about low-income women’s feelings about their financial stability. More than a third of the women polled wished they had delayed having children, and nearly 75% wished they had put more of a priority on their education. Women without college and high school degrees make up the vast majority of minimum wage earners, and are>> more likely to live in poverty in North Carolina. In fact, a 2013 report from the Institute for Women’s Policy Research showed that families headed by a single mother have the lowest median income of all families at $20,000 annually. While that figure puts a mom with one or two children still below the poverty line, it actually represents a full-time hourly wage of $9.60 an hour– $2.35 more than North Carolina’s current minimum wage. It comes as no surprise then that more than 42% of these moms report stress levels that are so high they consider taking time off from work to cope. President Obama has recently called on Congress to raise the minimum wage to $10 an hour, an amount that could help pull hundreds of thousands of North Carolinians out of poverty. At least >>19 states have set higher minimum wages, and while more are considering measures that would fairly compensate workers, North Carolina is not among them. Although>> research shows that increasing the minimum wage would benefit low- and middle-income workers as well as decreasing reliance on social programs such as Food Stamps, many politicians say they fear higher pay would drive business out of the state and lead to job loss. Researchers who worked on The Shriver Report recommend tackling pay inequality and increasing workplace support for women in general. Although younger, college-educated women are increasingly approaching pay parity, low-income and blue collar women still earn only a percentage of what their male counterparts bring home. The weight of so much financial strain is unraveling the mental health of female workers and leaving them feeling unsupported and without options. Women make up only >>23% of representatives in the North Carolina General Assembly– despite making up>> more than half of the general population. It is essential that we speak up about what workplace inequality means to us. Lawmakers must learn about the human toll that a lack of maternity leave, job flexibility, and good pay means to women in our state. According to the Shriver Report, more than 73% of Americans believe women should receive equal pay, and 78% said all women and families should have access to health care. These are not marginal interests, or special needs. The health and livelihood of our state’s women is essential to the well being of our population as whole.